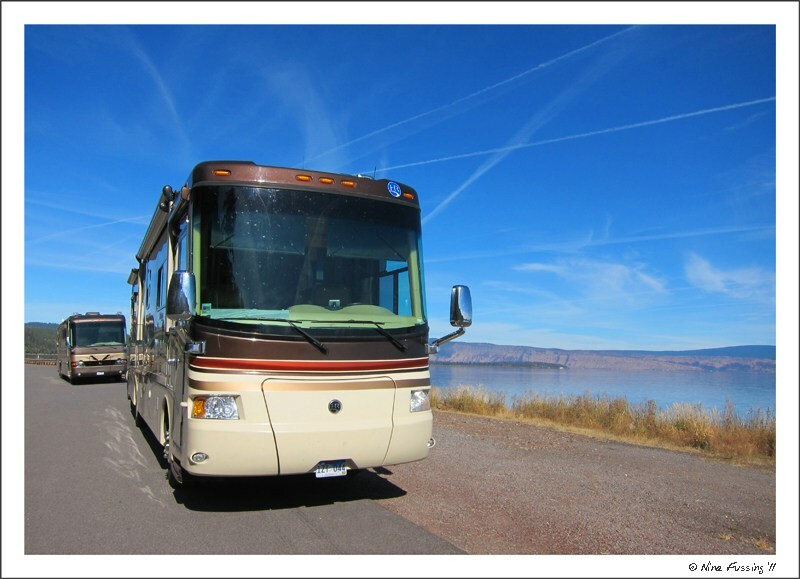 If you’ve never heard the term, “caravaning,” it means several RVs traveling together over a period of time. 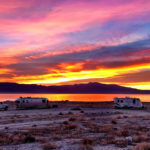 RV clubs, such as Escapees, organize formal caravans to specific locations, such as Mexico (a popular caravan, especially for first-time RVers), and then there are informal caravans that happen when RVers meet and either plan, or spontaneously decide, to travel along together for a while. We’ve only participated in informal caravans, and it’s always been a fun experience. We’ve caravaned together with folks for as short as a week to as long as several months, and in groups of up to four rigs. 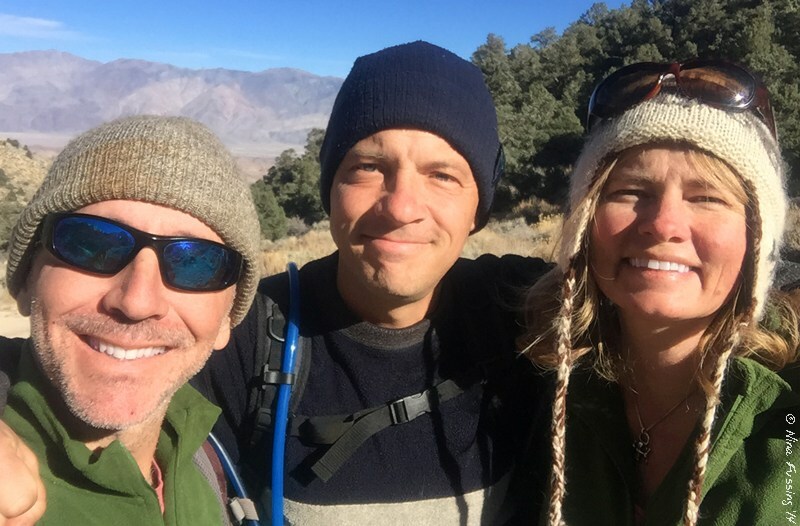 Of course, part of our traveling happiness is that we’ve always traveled with folks we like and feel we have stuff in common. But even then, most of the folks we’ve caravaned with have been RV buddies that we’ve only known for short times (sometimes only a few days) before we decided to hitch up together. 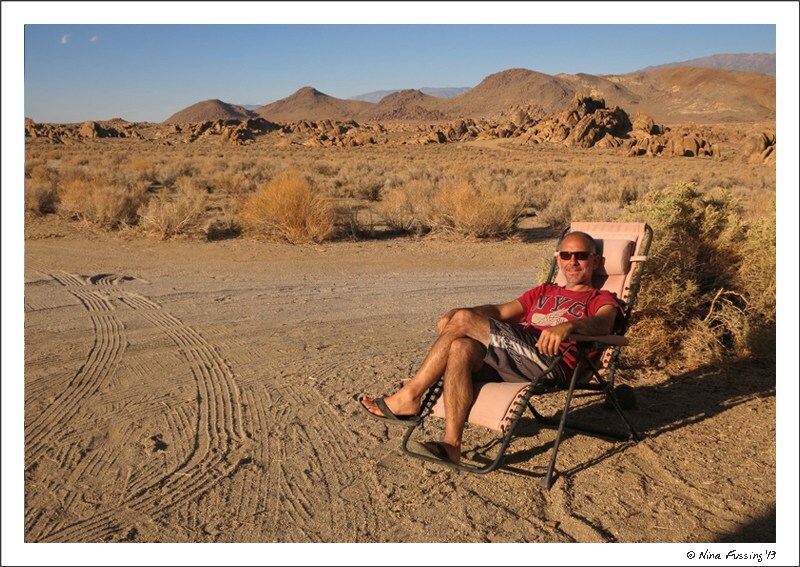 So, how do you manage RV caravaning without driving each other nuts? What if you end up disliking each other, or what if your new buddies have weird, all-night, happy-hour habits you didn’t know about? In my opinion, the key is communication and keeping it loose. Even if things don’t work out between you, setting expectations up-front can help to ease along the process and ensure you have an “out” if you need it. Sounds rather prophetic and deep, doesn’t it? Seriously, though, knowing yourself and your own (or your families) limits is the first key to establishing a base of operation with your RV buddies. If you’re the kind of person who needs a lot of alone time (kinda us), or you’re the type who will only go to places that are dog-friendly (yup, that’s us), or you don’t drink (errr, not us), or you hate potlucks (ho hum), this is important stuff to share with your RV buddies. Can you handle being around people day-to-day? Are you the kind who likes everything organized ahead of time? Do you like to sightsee every day? Or, do you prefer more home-days and a casual, laid-back itinerary? Do you need a lot of personal space? This is really the basis to #2 and setting expectations with your buddies. The more you know yourself and your own likes and needs, the happier you are going to be in the company of others when those needs are met. They say most things in life can be resolved through good communication, and I do believe that’s true. Once you’ve grilled yourself on the questions in #1, it’s time to have a casual talk with your RV caravanning buddies and set expectations for the road ahead. Even if you’re part of a formal caravan, you can always talk to the wagonmaster about some of these concerns before you sign up. Decide ahead of time if you want to travel from spot to spot as a team, or if you would rather leave at separate times and meet up when you get there. Some people like the togetherness of being on the road within view of each other, while others will literally go nuts with this arrangement. We’ve tried both and have decided we really prefer to travel separately. 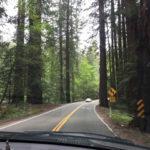 We have a different pace than most folks as we rarely leave a place before 10:00 a.m. We sometimes like to take a different route (maybe a back road) and we don’t like to stop for rests along the way. That’s just our style. The last thing we want is the frustration of waiting for another RV or stopping along the way when we’re itching to keep going. So, we tell our buddies “we’ll just meet you there,” and that works best for us. For those who like to stay in sight without actually being in sight, there are plenty of apps that allow you to keep track of each other without chaining yourselves to each other’s travel pace. We particularly like the “Find My Friends” app (available on Apple and Android) and use that, together with texting, to stay connected on the road. Some folks use CB radios, while others only rely on cell phone calls. Most folks will choose to park together when they travel together, but that doesn’t necessarily mean you have to be side-by-side. 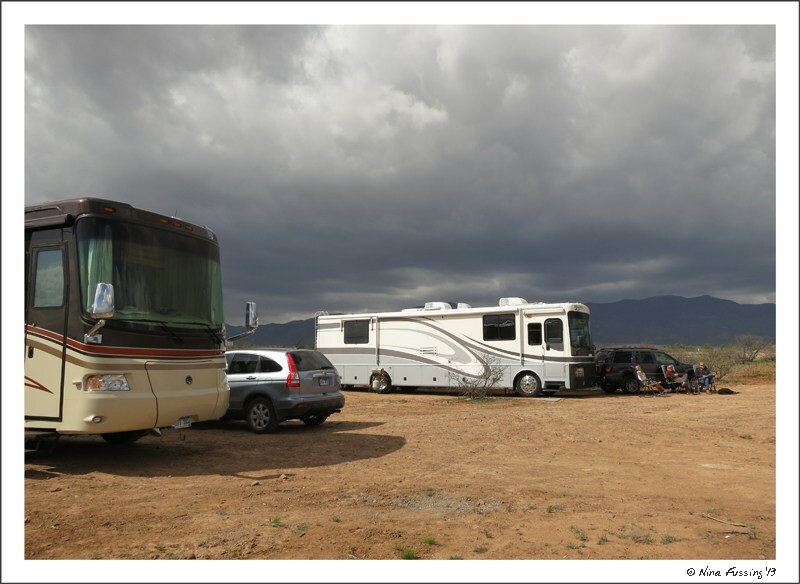 If you’re boondocking, you might choose a site a little ways away from your neighbor, or if you’re in an RV park, you might decide to park opposite your friends. If you really need your space, talk about it up-front so your buddies know it’s not personal when you park a bit away from them. 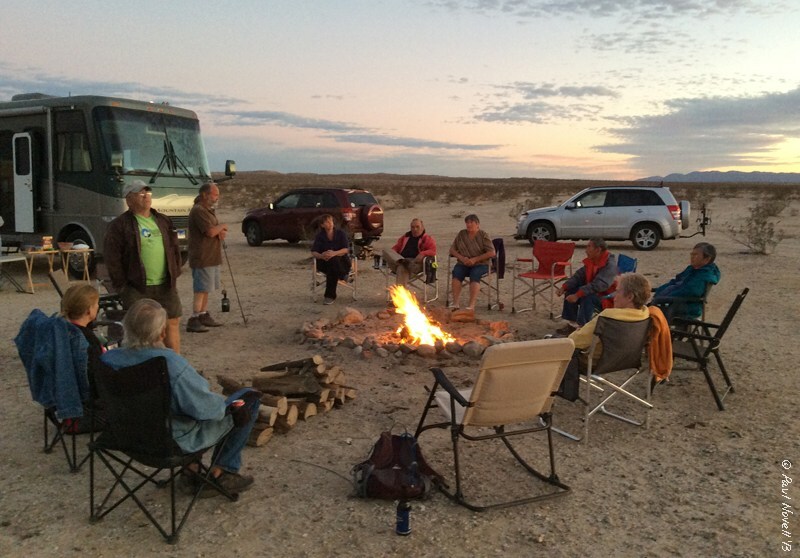 RVers like to socialize, and the vast majority of RV caravans have many happy hours and potlucks. Some even organize get-togethers every night. If you are a happy-hour-every-evening kind of person, ask your buddies if they would like that, too. If you prefer to eat in groups, talk about it. If you prefer to eat alone, share that info as well. We do happy hours quite often (not every night) and share food maybe once or twice a week, but it’s a loose schedule and many evenings we prefer to have a quiet night to ourselves. This is perhaps the biggest area that folks will differ in their travel styles. Some folks love to go and see everything there is in an area and need to be out every day. Others might be working during the day and need to stay in and have quiet time during office hours (really important to know). Others like to relax without too many outings at all. We’re a mix of the latter and rarely pre-plan any specific outings with our caravan buddies. Our work doesn’t have specific office hours, but we do work during the day and enjoy lots of home relaxing time and occasional days off during the week. If we’re going for a hike, a sightseeing spot or out to dinner, we might ask our buddies if they’d like to come along. But most days we just stay at home, work on our stuff and enjoy wherever we are with our pets. Our caravan buddies know we’re not the super-sightseeing type, so they are free to speed around and see the area while we stay at home. Knowing these these types of things about each other makes for much better together time once you arrive at your destination. We’ve rarely ever set specific timeframes for our caravans since most of them have happened rather spontaneously. But if you’re doing this for the first time, or planning ahead or traveling with folks that you don’t know well, it may make sense to put a time limit on your togetherness. A couple of weeks is easy, whereas a month can start to feel really long if you find yourself in the wrong company. If you decide to specify a time frame, my advice is to err on the short side since it’s much easier to extend than cut short. Nobody minds if you ask them whether they’d like to keep going together for a few more weeks, whereas many folks might feel really hurt if you sneak out early. By definition, RVing is all about “Jello planning” and accepting that stuff happens, especially when you least expect it. Believe me when I tell you that opening yourself to your “Jello” side will make you a much happier RVer in the long run. You could have an unexpected mechanical issue; you might decide you don’t like a place or you may need to get away from your caravan for some alone time. Allowing for those flexibilities will make your caravan experience a more pleasant one. With our current RV caravanning buddies, we set the expectation up-front that we did not need to travel together every step of the way. Plus, we gave each other the flexibility to jump ahead, stay a few days extra at a given location or to just leave and be off. Our best caravans have been those where everyone kept it loose and accepted each other’s need for alone time, but you might be different. The key is to talk and be up-front about your needs. 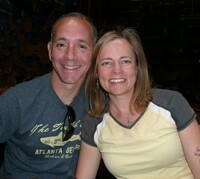 We’ve loved our caravan experiences and will likely continue them as we meet and enjoy folks on the road. It’s all part of our master Jello plan. 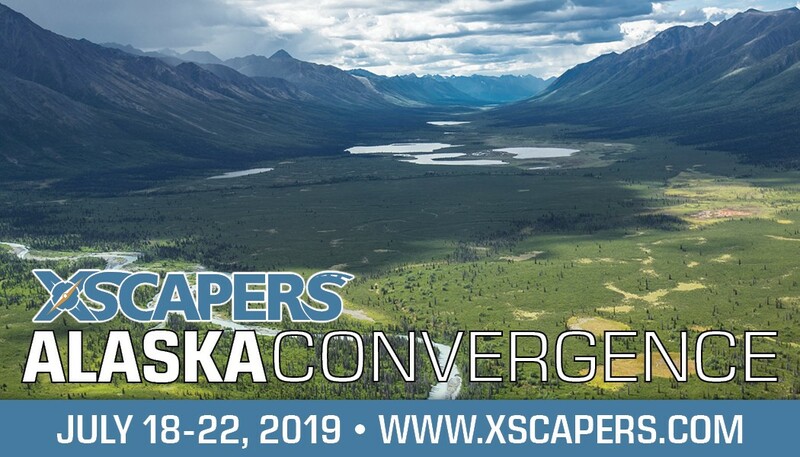 I just joined Xcapers (via Escapees) and am totally green to all this. I intend to buy an RV in the next few months and hit the open road. 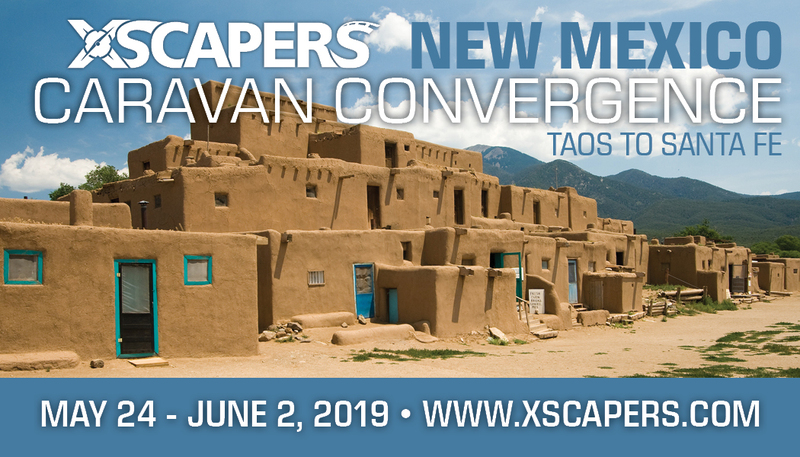 I’d like to know how one can connect with fellow Xcapers or join a caravan. Any guidance, clarity would be most welcome. 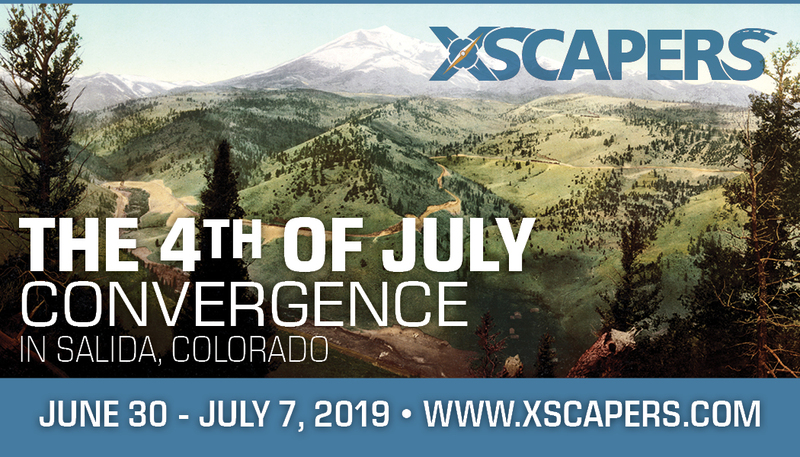 You can also join the Xscapers Facebook group. They’re VERY active and a great community to be part of. You’ll see announcements of upcoming convergences on there.